Join Georgia River Network for a voyage down the Satilla River. Spring on the Satilla is the ultimate south Georgia river adventure. In early April while north Georgia is just emerging from the winter doldrums, the Satilla River in far southeast Georgia will be brimming with life…(and in early April, not brimming with the eternal heat of summer!). For two nights you’ll tent camp atop Long Bluff at rustic Satilla Lodge overlooking the river and over the course of two days of paddling you’ll experience nearly 21 miles of this blackwater gem where moss-draped cypress and tupelo crowd the banks and where it seems oxbow lakes and sloughs radiate from every bend. Educational programs, catered meals, campfires and camaraderie round out a weekend of leisurely paddling and first-rate camping. 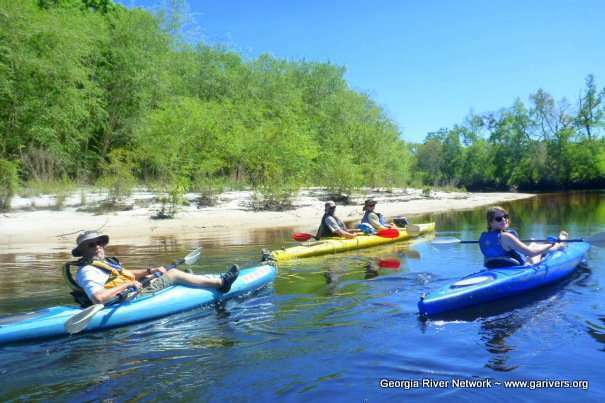 Your Spring on the Satilla registration includes all meals, shuttle services and campsites as well as a T-shirt, boat decals, maps and river descriptions, a year’s membership to Georgia River Network, entertainment, activities, and educational programs. Registration opened Dec. 26, 2018 at 8 a.m. and will continue until all spaces are filled! Limit: 120 participants. When you think Deep South rivers, the Satilla is likely the image your mind conjures. Its slow-moving blackwater, moss-draped cypress and tupelo forests, rustic riverside fish camps, meandering oxbows and swampy sloughs are the stuff of southern folklore. As the crow flies, the 21-mile run of the Satilla explored during Spring on the Satilla is just 20 miles from the heart of the Okefenokee Swamp, and like the swamp, it is wild, remote and beautiful. Each day’s journey is short to allow time for exploring off-river sloughs, to learn about the river and its life through educational programs and to enjoy a leisurely camp and great catered meals atop a bluff overlooking the river. If you want to experience one of Georgia’s most iconic landscapes at its best, this is the weekend for you. Friday, April 5, 2019: Boat Drop off, Camping and Safety Briefing – Drop your boat at our initial launch site and set up your camp at Satilla Lodge on the bank of the Satilla River. Our first dinner will be served this evening followed by a mandatory safety briefing and educational program. On this 14-mile run, the river is black and beautiful, but the real highlight is exploring the oxbow lakes and sloughs that seem to radiate from the river’s every bend. The route is both wild and rustic, flowing past tractless acres of bottomland swamps and backwoods fish camps. Cruise past the presumed site of a historic colonial-era “fort” and slip beneath the shadow of picturesque bluffs on this 7-mile run. The trip includes a portion of tidally-influenced river. The tide will turn at about 9 a.m. on this day, meaning that for a portion of the day’s journey, you will paddle against the incoming tide…unless you choose to wait for the tide to turn. The river will begin flowing back out to sea about 1:30 p.m.! All paddlers should bring standard camping gear including a tent and personal items. We encourage those who love to tent camp to join us at a beautiful spot atop Long Bluff overlooking the river adjacent to Satilla Lodge, a private rustic retreat www.satillalodge.com. However, if your idea of roughing it is a Motel 6 instead of the Ritz-Carlton, hotel accommodations are located about 16 miles from our campsite in Woodbine and Folkston. In addition, there are five private indoor options at Satilla Lodge that are available for additional fees through our online registration form…while they last. Additionally, porta-toilets and outdoor showers will be provided. There will be limited access to indoor toilets and showers. Click here for lodging information in the Folkston area. Click here for lodging information in the Kingsland/Woodbine area. Breakfast, lunch and dinner are provided with your registration. Paddle Georgia participants are a family and we like to eat together! You may want to bring your favorite between meal snack. If you don’t have your own boat, Southeastern Adventure Outfitters on St. Simons serves as the official outfitter of Spring on the Satilla. They will deliver your boat to our initial launch site and pick it up at our final take out. Solo boats are $110; tandem boats $130. Click here to reserve your boat with Southeastern Adventure Outfitters. How many people participate? 12O spots are available. Like our other Paddle Georgia events, participants will range in age from 4 to 84 and come from all walks of life. But, they all have one thing in common—they love to paddle and they love Georgia rivers! How much does it cost? It costs enough to help Georgia River Network save our rivers! Registration fees are $235 for adults, $185 for children 8-17 and $115 for children 7 and under. These fees include six meals: two hot breakfasts and dinners and two sack lunches to take on the river. Participants can also paddle for FREE. Simply raise at least $460 in the Paddle Georgia Canoe-a-thon and you may request to have your registration fees reimbursed. All proceeds from Spring on the Satilla are used to support Georgia River Network and Satilla Riverkeeper programs to protect the Satilla and Georgia’s other rivers. What’s a Canoe-A-Thon? Like a walk-a-thon, Paddle Georgia’s 2019 Canoe-A-Thon which began Aug. 1, 2018 will raise money for Georgia River Network. Each participant is asked to solicit donations on a per-mile basis. Those participants generating more than $460 may choose to have their Spring on the Satilla registration fee reimbursed. Click here for more details. Canoe-A-Thoners compete for gifts and prizes, including new canoes and kayaks and other great goods from Outside World Outfitters and our many other sponsors. These prizes will be awarded at Paddle Georgia 2019 (Canoe-a-thon participants do not need to present to win these prizes). Participants can sign-up and start raising funds immediately! How will Spring on the Satilla be different from other Paddle Georgia events? 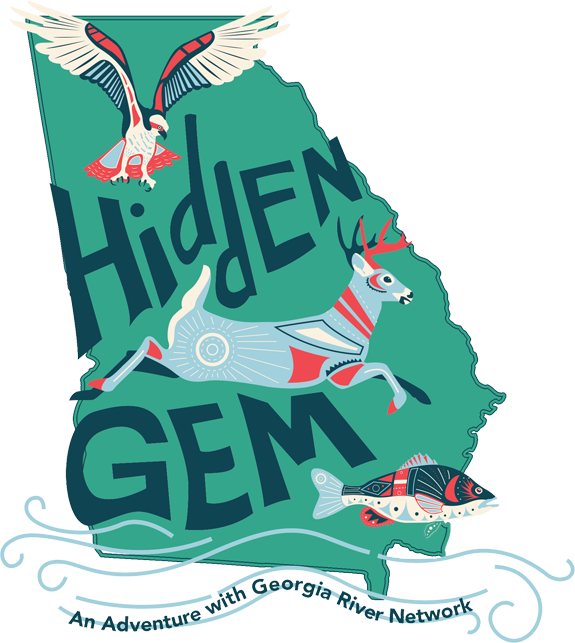 First, it’s on the breathtaking Satilla, a true south Georgia blackwater beauty that wanders between cypress and tupelo-lined banks. For two days we will camp at rustic Satilla Lodge, a privately-owned retreat that overlooks the river. Camping is tent camping only with limited access to indoor facilities, showers and toilets. Like other Paddle Georgia events, transportation will be provided to and from launch sites/take outs, and since our campsite remains the same both nights, there’s no need to carry your gear in your boat…or load up to move camp! Catered meals will be provided, and at the end of each day’s paddle, you will always have access to your vehicle. Do I need to be an experienced paddler? You don’t need to be an expert, but a little experience wouldn’t hurt. If you are new to paddling, we ask that you take a basic canoeing or kayaking instruction class offered through the Georgia Canoe Association or other instructors. Please note, the second day of the journey will involve paddling against an incoming tide–the equivalent of paddling upstream. It can be done, but it can be strenuous. What do I need to bring? You are responsible for bringing a canoe or kayak, paddles and a personal floatation device. Paddle Georgia does not supply or rent boats. Southeast Adventure Outfitters serves as our official canoe and kayak rental facility for Spring on the Satilla (see link above) and can deliver your boat rental to our initial launch site and pick it up at the end of the trip. All paddlers should bring standard camping gear including a tent and personal items. Your boat should be of a size and weight that you and another person can carry. Where do I leave my car? All cars will be parked at our campsite, Satilla Lodge. Transportation will be provided to and from launch sites and take out sites. How do I get my boat to the river? Before the paddle begins, you will drop your boat at our initial launch site. Your boat will remain at the river throughout the trip. Overnight security will be provided for the boats. The trip ends at Satilla Lodge so once you complete your paddle, you’ll simply load up your boat and motor back home. Can I fish during Spring on the Satilla? Yes, but you are responsible for obtaining appropriate licenses and understanding and following the proper rules and regulations. All participants must possess basic paddling skills and be capable of self-rescue in the water. Registration and meal fees may be reimbursed prior to March 22. Refunds will deduct a 10% processing fee. Very Important! You Must Sign These Forms to Participate! All participants must sign a liability waiver. Click on the links below and sign the form online. Once submitted, you will receive an e-mail. YOU MUST RESPOND TO THAT E-MAIL TO COMPLETE THE LIABILITY WAIVER PROCESS.